Stock #2016MICROPAVECOLLECTION1142PTENG: Platinum Delicate Micro Pave Halo Split Shank Flower Engagement Ring With Fine Engraving On The Sides Featuring Round-Cut Blue Sapphires & Sparkling White Diamonds with approx 3.25 carats total weight for $9950.00. This ring comes with a professional Third Party Appraisal. Stock #2016MICROPAVECOLLECTION1142PTWB: Platinum Delicate Micro Pave Wedding Ring With Fine Engraving On The Sides Featuring Round-Cut Blue Sapphires & Sparkling White Diamonds with approx 1.0 carats total weight for $2750.00. This ring comes with a professional Third Party Appraisal. 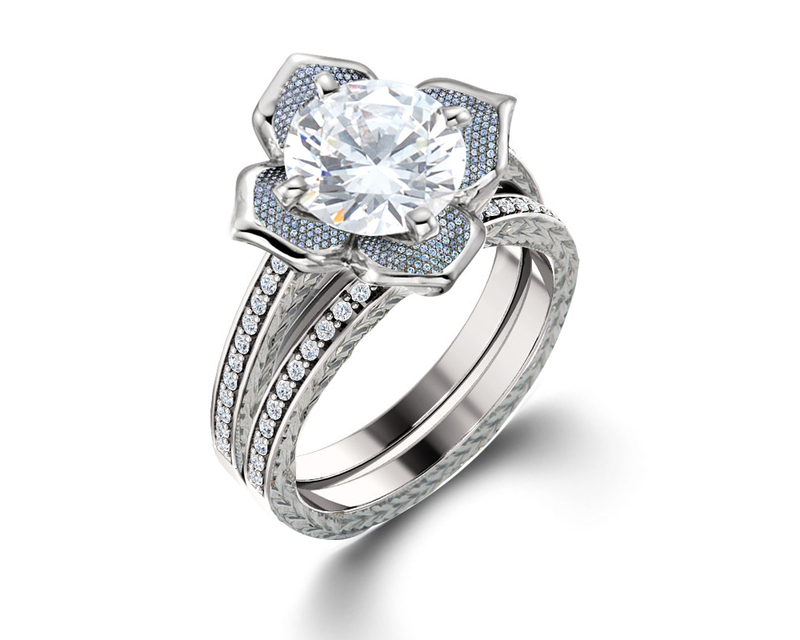 Stock #2016MICROPAVECOLLECTION1142GOENG: 14K White, Yellow or Rose Gold Delicate Micro Pave Halo Flower Engagement Ring With Fine Engraving On The Sides Featuring Round-Cut Blue Sapphires & Sparkling White Diamonds with approx 3.25 carats total weight for $9750.00. This ring comes with a professional Third Party Appraisal. Stock #2016MICROPAVECOLLECTION1142GOWB:14K White, Yellow or Rose Gold Delicate Micro Pave Wedding Ring With Fine Engraving On The Sides Featuring Round-Cut Blue Sapphires & Sparkling White Diamonds with approx 1.0 carats total weight for $2550.00. This ring comes with a professional Third Party Appraisal. Stock #2016MICROPAVECOLLECTION1143PTENG: Platinum Delicate Micro Pave Halo Split Shank Flower Engagement Ring Featuring Round-Cut Blue Sapphires & Sparkling White Diamonds with approx 4.25 carats total weight for $13450.00. This ring comes with a professional Third Party Appraisal. Stock #2016MICROPAVECOLLECTION1143PTWB: Platinum Delicate Micro Pave Wedding Ring With Fine Engraving On The Sides Featuring Round-Cut Blue Sapphires & Sparkling White Diamonds with approx 1.25 carats total weight for $3050.00. This ring comes with a professional Third Party Appraisal. Stock #2016MICROPAVECOLLECTION1143GOENG:14K White, Yellow or Rose Gold Delicate Micro Pave Halo Flower Engagement Ring Featuring Round-Cut Blue Sapphires & Sparkling White Diamonds with approx 4.25 carats total weight for $13250.00. This ring comes with a professional Third Party Appraisal. Stock #2016MICROPAVECOLLECTION1143GOWB:14K White, Yellow or Rose Gold Delicate Micro Pave Wedding Ring With Fine Engraving On The Sides Featuring Round-Cut Blue Sapphires & Sparkling White Diamonds with approx 1.25 carats total weight for $2850.00. This ring comes with a professional Third Party Appraisal.